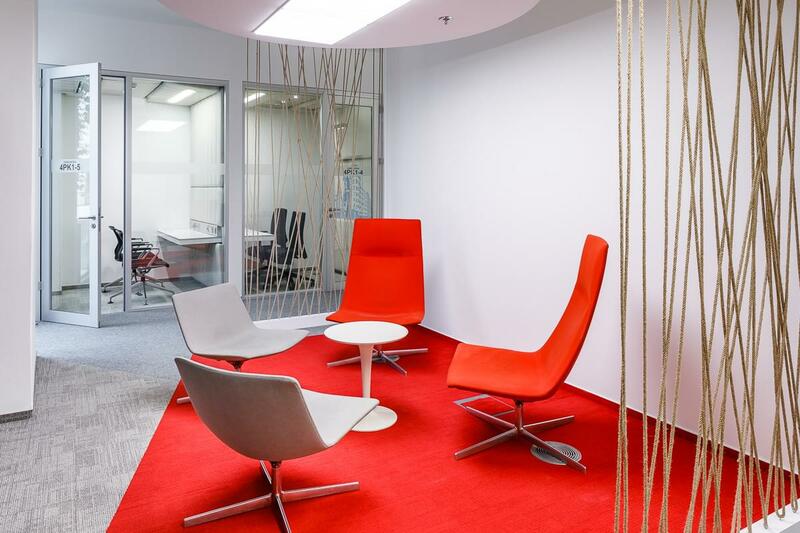 Besides the rainbow-coloured conference rooms we also designed and implemented other parts of the Seznam.cz office: an open space, kitchenettes and small relaxation ones. 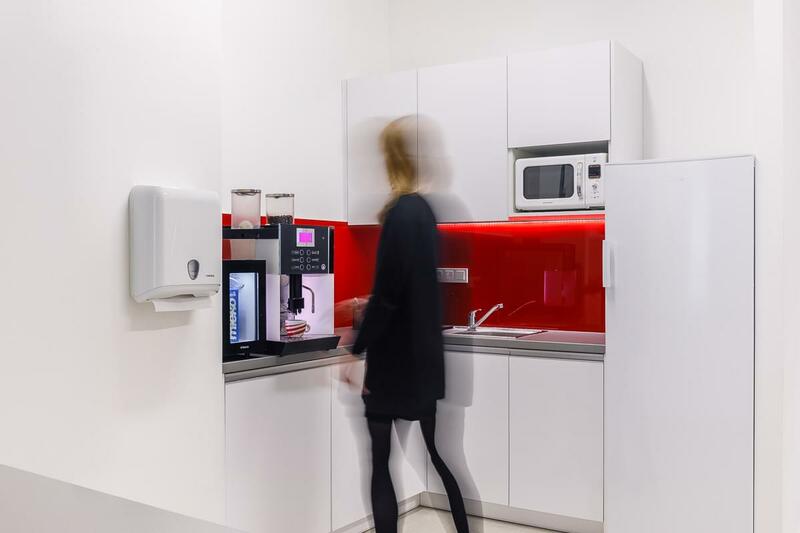 We cheered up the formerly dark and dull spaces in accordance with the company's identity and with a focus on flexibility. This is especially important for the company in light of their constant growth and changes across teams. 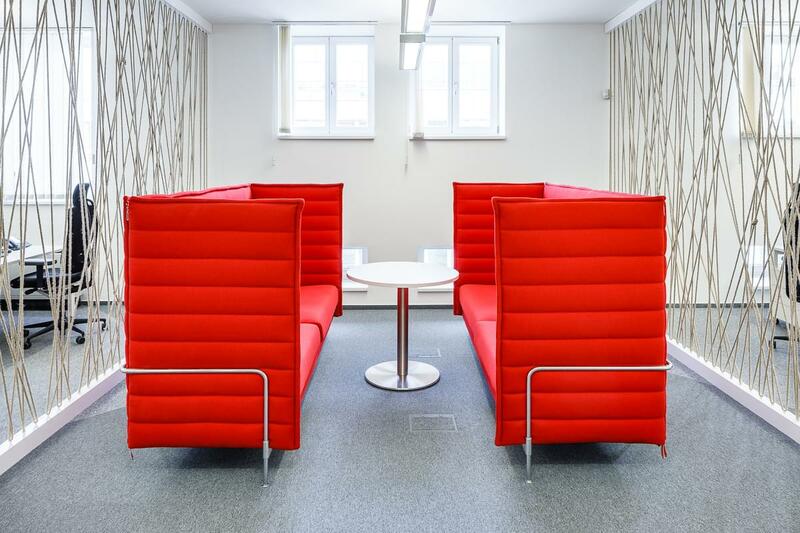 Our architect, Tereza Bradová, livened up the spaces with shades of red, grey and black, reflecting the company's corporate colours. A sense of playfulness was brought into the space through original patterns on the carpets as well as with stretched out ropes. These ropes also serve as a decorative element. This natural material is a decoration in itself, but also allows employees to pin pictures and photos from private and corporate events. 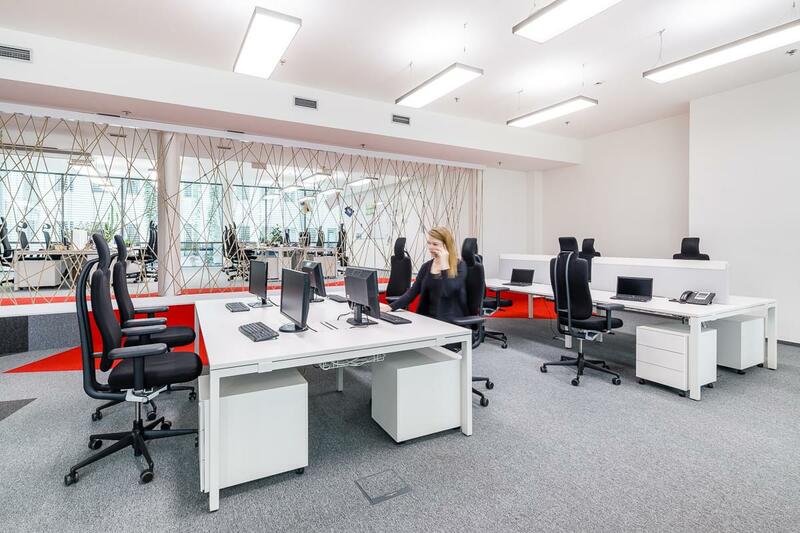 The employees themselves can thus improve the space and make it cosier. The kitchen is characterized by a simple and clean design. White is the dominant colour, variegated by a grey worktop and a red glossy lining. The kitchenettes are furnished with Wing chairs and Tabula tables, both from ACTIU. The tensioned ropes perform several functions. 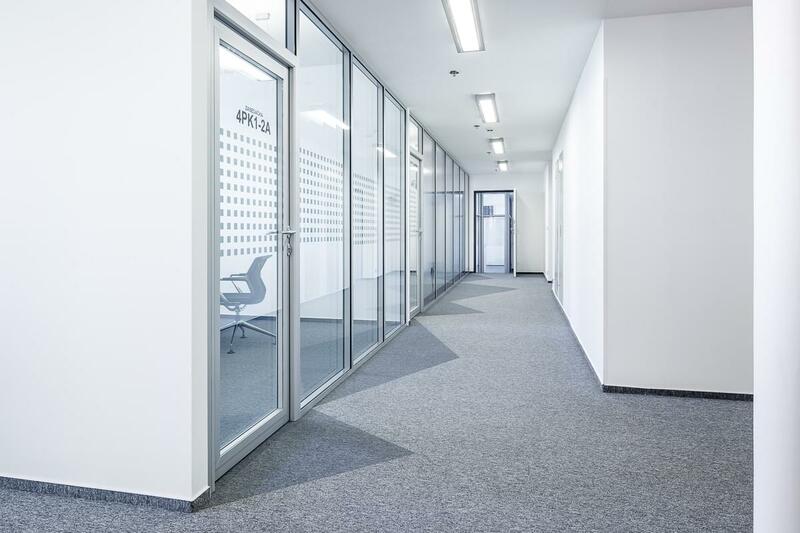 They allow the space to be flexibly modified and divided without major construction interventions, which is perfectly suited for a dynamically developing company like Seznam.cz. The organizational structure inside and outside the team is constantly changing, and the space needs to be adaptable. 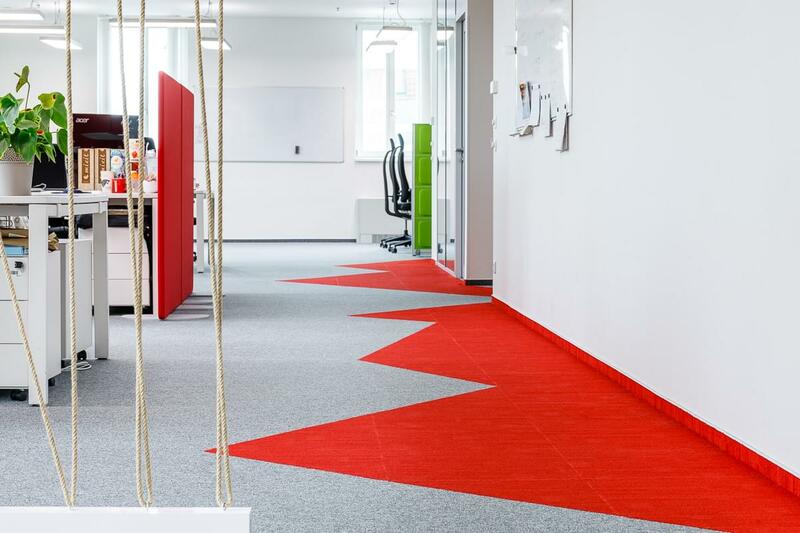 The barrier formed by the rope separates the two parts of the open space and together with the imaginative carpets break up the otherwise plain spaces. 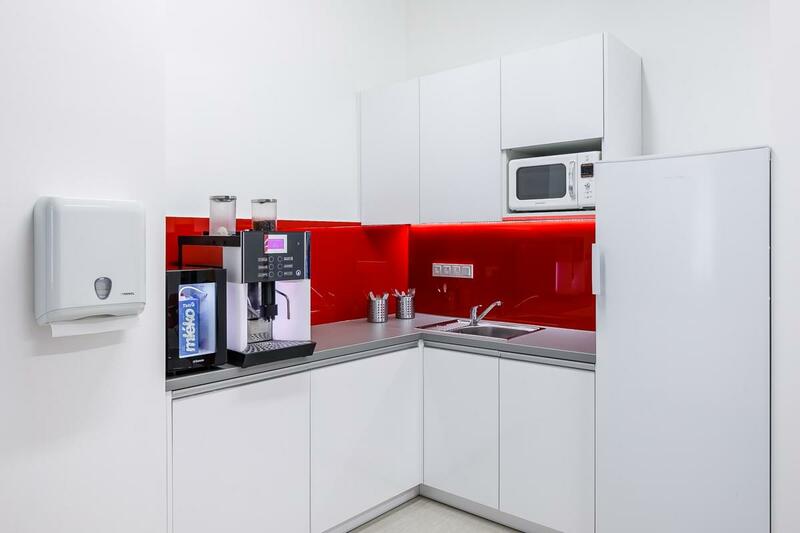 In the offices we also created a so-called safe haven, where employees can rest during a coffee break. The red seats match the carpet. The feeling of well-being is enhanced by ropes, which again define the space. 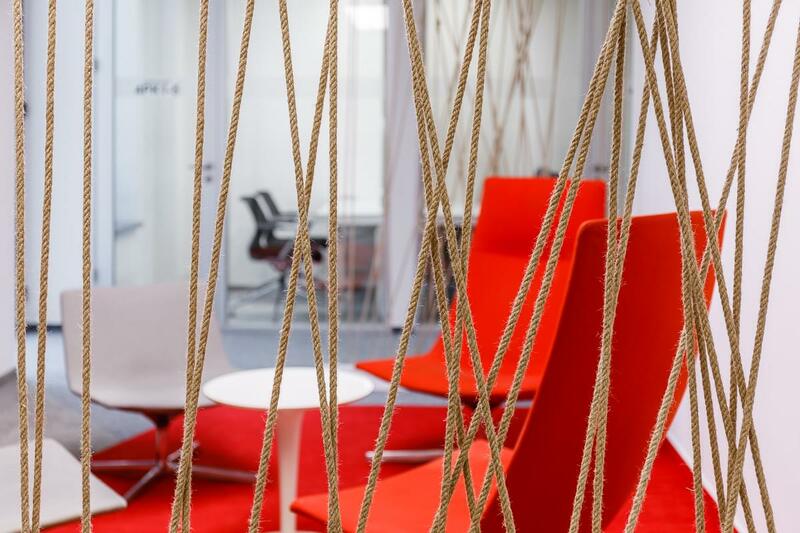 And the same colour spectrum is also used in the relaxation zones for rest or quick meetings.